Powered by Mom Blog is part of this fantastic giveaway! This is one tough camera perfect for any occasion! Waterproof and Shockproof! A Camera Your Kids can’t Destroy! Sponsored by Mom Blog Society, Mom Does Reviews, Emptynester Reviews and The Deals and More! The Coleman Xtreme C5WP Shock & Waterproof Digital Camera combines 12.0-megapixels with a f/3.0 wide-angle lens, anti-shake image-stabilization, and a high-resolution 2.7-inch LCD. The C5WP also offers waterproof protection up to 33 feet (10 meters), shock resistance up to 3.2 feet, and is freezeproof to -10C (14F), making it the perfect companion for all sorts of outdoor activities. Take more high-resolution pictures faster with this 8GB High-Capacity MicroSD SecureDigital (SDHC) Class 6 memory card with included SD Adapter. Increase your shooting capacity with this powerful NP-20 Lithium-ion rechargeable battery. Designed for use with nearly any compact waterproof camera — this Floating Foam Camera Strap is constructed of tough nylon, buoyant foam and durable plastic. A quick release snap at the end of the strap makes it simple to remove and reattach, and the bright orange exterior material makes this strap easy to spot when floating in water. Transfer files quickly and easily, and conserve your camera’s battery life, with this convenient USB 2.0 SecureDigital (SD) Card Reader. This would a perfect camera for active families! Where would you use it first if you won? « $100 Gymboree Gift Card Giveaway Ends 7/8 @ 11:59pm EST. I am going to Maryland for my boyfriends birthday. =] Can’t wait! Hopefully will be going to beach. Hopefully Florida with my two children for the first time! We are hoping to go camping before the end of summer and this would be great to capture the memories! We are spending all our free time in the pool trying to get great pictures. Yes we are going on a cruise next month 🙂 can’t wait! PLEEEEEEEEEEEEEEEEAAAAAAAAAAAAASSSSSSSSSSSSSSSEEEEEEEEEEEEEEE!!!!!!!!!!!!!! Three kids as a single mom have broken me!!!!!!!!!!!!!!!!!!!!! LOL!!! Seriously. My baby girl turns 13 this year and I’d love to have a waterproof camera for her pool party!! 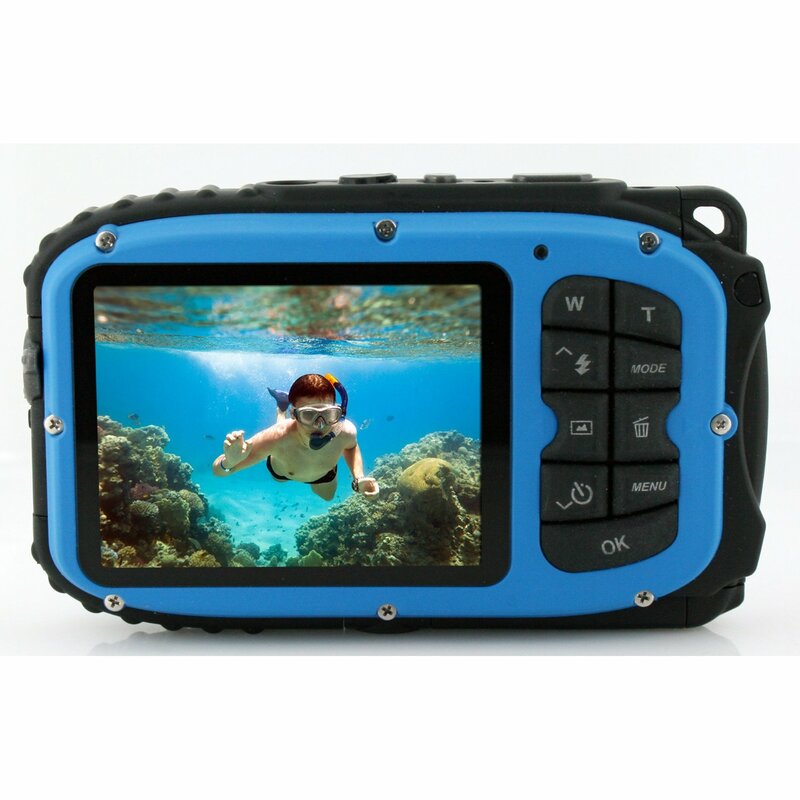 We have been looking for waterproof cameras! This one sounds awesome! Would love to have it for the pool!! This camera would be great for snorkeling off the coast of Key West. I need this for a local water park! We are planning a trip to Finland in August, so it would be great! I am going to Finland. I could really use a nice camera to take there. I am going to Iowa from FL for my grandson’s wedding. I will also be visiting with other family members – many chances to get some really good pictures if I had this great camera! This would be so fun to use with the kids at the beach! We Are Going To The Beaches On The Coast Of California And Disneyland…..
To the zoo and aquarium and then next year to the beach. This would be great to get some pictures of scalloping and the Manatees out on the boat. On our usual trips to the Lake to swim, we see so much wildlife here! Yes, this camera is perfect for our outings! I have great things to do and see where I live. Florida is so much fun! We are going to The Wisconsin Dells and they have a water park! Would love to be able to take pictures of my daughters new apartment! Right now I have no camera so this would be an awesome win! We’re going to Central Oregon with the family! There will be swimming so this would be great to take to the pool! I think it would be great to take to the beach. We live in FL not far from the beach and within walking distance of the marina so this would be awesome to have summertime or otherwise. We are staying home this summer. I’m hoping to win this for my daughter. Her birthday is in 16 days. We are staying home this summer. I’m hoping to win it for my 4 (almost 5) year old daughter. Her birthday is in 16 days and she asked for a camera. My son has canoe and camping trips all summer with the boyscouts. He could really use a camera. I would love to take this to the lake with us this summer. I would love to take this with us to the lake this summer. We don’t have any specific plans for the summer, but we do want to take our Seadoo out a few times and this camera would give me the chance to take some great action shots! We are going to the beach this woild be great. Not going anywhere special but I love to document all the kids’ activities!! I’d like a camera like this for when we go to the lake or go swimming. Not going anywhere this year but I would like to give the camera to a friend who is going on vacation if I should win. Thanks for doing the giveaway. I’m going on a vacation for the first time in 4 yrs!! There will be lots of swimming and horsing around so this camera would be perfect!! We are going to Ocean City, MD, this summer. I love taking a lot of pictures of the kids having fun. We are going to Florida. THis camera would wor great on that trip. I would use this awesome camera while on the Lake taking pictures! My son and his fiance are leaving for Jamaica this summer and I would love to see them have a camera like this with them! I would use it more locally at the shore and some state parks! I am going to the beach and I will need a camera with me!!! We’ll be going on multiple motorcycle trips this summer so yes! Not going anywhere but in the backyard pool. This would be great to get some fun pictures of the kids underwater! No, I do not get to go anywhere but I do not have a camera and I need one for the reviews I do. We may go to Galveston, TX to visit my son’s family. What fun to have this while visiting the grands! This camera would motivate me to travel somwhere I could use it! I’m going to Denver! Would live to take this camera with me!